Home Which Approach Is Right for Repairing a Calcaneus Fracture? Three experienced foot and ankle surgeons discuss the differences and commonalities between the lateral extensile and sinus tarsi approaches to managing these complicated fractures. Most calcaneus fractures are caused by high-energy impact, which in addition to the fracture causes extensive soft tissue injury. The calcaneus is compressed between the talus and the ground or other immovable object, which causes fractures of the sustentaculum, posterior facet, the lateral wall, and the insertion of the peroneal tendons. This combination of injuries cause talar collapse and dorsiflexion of the talus, hindfoot angulation, lateral wall “blow-out,” peroneal dislocation, and overall shortening of the foot – all of which must be addressed during surgery to restore anatomy and function and avoid complications. 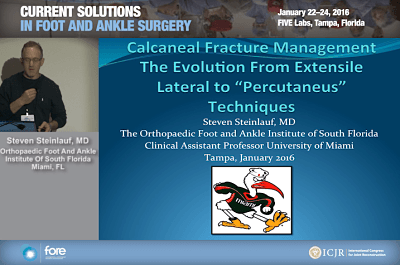 During the recent Current Solutions in Foot and Ankle Surgery meeting in Tampa, Florida, 3 surgeons – Adolph S. Flemister Jr., MD; Michael Swords, DO; and Steven Steinlauf, MD – reviewed their approaches to repairing these complicated fractures and shared their tips for how to perform these procedures successfully. Before deciding on an approach to repairing the fracture, Dr. Flemister recommends obtaining a CT scan to help in fully visualizing and classifying the fracture. He notes that classifying the fracture – he still primarily uses the Sanders classification – will help the surgeon decide on the best surgical approach. 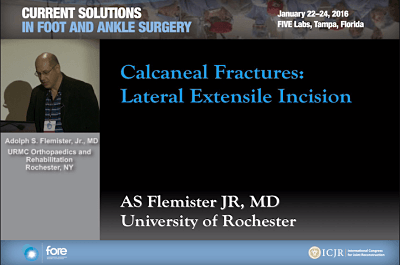 Dr. Flemister finds the traditional extensile lateral approach to be useful because it allows him direct visualization of the fracture and access to the calcaneocuboid joint. This approach makes it easier to reduce the lateral wall and allows peroneal tendon repair if necessary. But the lateral approach is not soft-tissue friendly: Surgery is generally only possible once the swelling of the surrounding soft tissue resolves. This approach also requires indirect medial reduction and puts the sural nerve at risk. Due to these soft tissue concerns, the surgeon should evaluate each patient and eliminate those with risk factors for healing complications such as smoking, diabetes, and vascular disease. The soft tissue healing concerns also makes the timing of surgery a delicate balance. Ideally, surgery should be done 7 to 21 days after the fracture – too early and healing complications can occur; too late, and the surgery itself becomes difficult. Dr. Flemister’s indications for using the extensile lateral approach are open reduction internal fixation for displaced Sanders type II and type II fractures with late presentation or a large deformity in a relatively healthy patient. He does not have a “hard and fast” age cut-off. Dr. Flemister said in his opinion, Sanders type IV fractures cannot be reconstructed, and so he recommends performing a primary fusion in these patients. Click the image below to watch Dr. Flemister’s presentation. Dr. Swords uses the sinus tarsi, or small incision, approach for approximately 99% of his ankle fracture cases. Since 2008, he has operated on more than 180 fractures – including open fractures – using this approach. Dr. Swords emphasized that the sinus tarsi approach does not compromise reduction of the fracture – he achieves the same reduction as with other approaches. The articular reduction can be directly visualized using a headlight, and with this approach Dr. Swords still aims to reestablish bony morphology to the entire calcaneus. The steps for reducing the fracture are identical between the lateral extensile and the sinus tarsi approaches, Dr. Swords said. It’s up to the surgeon to ensure that the quality of the reduction is the same as well. Obtaining better visualization of the anterior process and the calcaneocuboid joint can easily be accomplished by extending the incision 1 cm distally, he said. 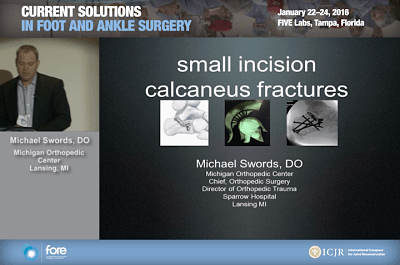 There is a learning curve to the sinus tarsi approach, and Dr. Swords believes it is necessary for the surgeon to perform many calcaneus fracture reductions using an open technique to help learn and understand fracture patterns. When first using the sinus tarsi approach, the surgeon should start with simple fractures that can be operated on early, while the fragments are still mobile. Click the image below to watch Dr. Swords’s presentation. “When deciding between utilizing an extensile lateral or a small incision percutaneous approach for a calcaneus fracture, it is important to look not only at the fracture, but also at your own technical capabilities,” Dr. Steinlauf said. He described the sinus tarsi approach as a modification of the standard techniques using smaller incisions, the concept being that the smaller incision will cause less damage to the soft tissues. The clinical outcomes of the sinus taris approach are similar to those of the extensile lateral approach, but with fewer infections and fewer wound healing problems. To further protect the skin and avoid wound healing problems, Dr. Steinlauf makes his incision 1cm longer than usually described for the sinus tarsi approach, extending the incision up over the tip of the fibula. This allows him better visualization without having to pull as much on the skin. He also protects the lateral calcaneal artery by avoiding deep dissection into the superior peroneal retinaculum. The workup, radiographs, and CT scans are the same for the traditional and sinus tarsi approaches, but the timing of surgery is different. With smaller incision techniques, Dr. Steinlauf still ensures there isn’t too much swelling, and soft tissue permitting he will do the operation within 1 to 14 days, which makes the fracture reduction much easier. Dr. Steinlauf advises surgeons who are learning the sinus tarsi approach to start with simple Sanders II-part fractures, to base the preoperative plan on a thorough work-up including CT scan, and to use compression wraps and RICE to decrease the swelling so that surgery can be performed within 14 days of the injury. Click the image below to watch Dr. Steinlauf’s presentation.